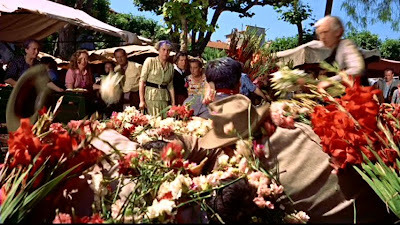 To Catch a Thief: Set in picturesque Monaco, even the obligatory chase scene, which takes place at a flower market, is beautiful. All the better to seduce audiences while sneaking in deeper philosophical ideas. In Alfred Hitchcock’s 1940 war propaganda flick Foreign Correspondent, Johnnie Jones (Joel McCrea) was a simpleminded, rakish beat reporter. But when his editor assigned him to Europe and changed his name to the Ivy League-ish "Huntley Haverstock," the reporter wasted no time living up to his new identity. The conceit that identity is something we own or create for ourselves was blithely undercut by another insight: identity is often foisted upon us. As the movie progressed, his newly-acquired identity became increasingly difficult to bear. As he more fully embodied what that name stood for (an intrepid wartime correspondent) he became more authentically "alive" – though in doing so he put his life at risk. Hitch continued to ponder the meaning of identity. 15 years after Foreign Correspondent, in To Catch a Thief, the film’s lead character, John Robie (Cary Grant) had a false, this time criminal, identity thrust upon him, which he spent the film trying to shake loose. The truth of the matter was kept ambiguous – at least as far as the audience was concerned – until the mystery was solved toward the end of the movie. Any presumption of his innocence could only be based on mere sympathy for the character and on the star status of Cary Grant. Who really are John Robie and Cary Grant? To Catch a Thief raises more questions on the subject than it answers. Four years after that, in North by Northwest, Hitch placed before audiences yet another character with identities inflicted on him against his will. 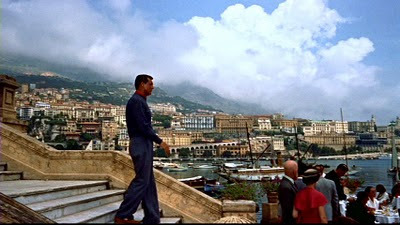 Unlike TCaT, though, the truth about Roger O. Thornhill (again played by Cary Grant) was confirmed at the film’s outset by no less an authority than his own mother, putting the audience at an advantage. Being fully convinced of Thornhill’s "wrong man" status, viewers could watch as he knocked himself out trying to convince others of who he "truly" was. In NxNW, spymaster Vandamm (James Mason) repeatedly accused Thornhill of giving a theatrical performance – pretending to be ad man Roger Thornhill. Vandamm insisted that he was United States Information Agent George Kaplan. "My name is Roger Thornhill," the ad executive replied. "It’s never been anything else." But that changed rapidly. Shortly thereafter, upon meeting Eve Kendall (Eva Marie Saint) on the train and now on the run from the law, he tried (and failed) to convince her that he was "Jack Phillips" of "Kingby Electronics." (As Murray Pomerance pointed out in An Eye for Hitchcock, "not just false identities can be laid upon us.... what we might call authentic ones can too.") Afterward, Thornhill stepped into the role of Kaplan, even getting "killed" in a staged gun attack using fake bullets – just like in the movies. Throughout all of this, though, Thornhill was merely a thin veneer over the actor who portrayed him, Cary Grant, whose constant mugging for the camera reminded audiences of whom they were really watching. (One scene in the hospital even treats us to the Hollywood fan world, when a bobby soxer swoons over Grant!) This house of mirrors-like labyrinth of identities could permutate forever as it works out such questions as, "who am I?" and "at which point to I ‘become’ the roles I take on?" Clearly, name, profession and social status are completely inadequate answers to these kinds of existential questions. For me, regarding the answer to that second question, the operative word is become. Thornhill learned that accouterments such as a driver’s license, a hotel key, a gray silk suit or even a recognizable face are unreliable identifiers. Instead, action itself is the thing – it was in the act of becoming Kaplan that he found himself. In becoming, he became alive. That’s the lesson that I take from Sartre’s dictum, "As far as men go, it is not what they are that interests me, but what they can become." If that is the case, then its opposite might also be true: to stop becoming is to die. And that’s what I mean when I suggest that Hitchcock’s films are philosophy.